No Fenders -Formula 1, IndyCar and A Whole lot more..: Justin Walks Away? Whilst doin’ my daily Internetz trollin’, I came across a very short story by ‘Juan of the Wedge Brothers – specifically Alan Wedge over at Grab Bag Sports... Lamenting the apparent loss of SPEED’s Justin Bell, who I magically caught both segments of Justin’s CrowdCrawl at le Sarthe upon le Memorex... And as those BLOODY BRITS would say: BRILLIANT! Or is that those ‘Aussies instead, eh? Thus, I don’t know if Justin is truly leaving the SPEED Network or not? As he mused into the Camera Eye that he’d be writing books from now on, WTF? As I for ‘Juan can personally say I enjoy Justin’s British wit and find him far MORE palatable then his predecessor, the overinflated great Allen “dee Cadden-eh!” (Alain de Cadenet) So, please DON’T go Justin! And it was an interesting comment, which I believe Leigh Diffey made ‘bout how Justin can joke around with Vanina Ickx – seeing how they’ve spent countless hours growing up around each other, with Justin’s Old Man Derrick having won LeMans a time or three with Vanina’s Papa Jacky, being known as the previous Mr. LeMans - before some ‘Dane named tom Kristensen showed up. As Y’all may know, Derrick won the 24 Heurs du Mans five times while Jacky notched up six overall victories at Circuit de la Sarthe – one being the closest finish in the track’s history I believe... When Jacky drove the wheels off of the older (obsolete) JW Automotive Gulf Oil liveried Ford GT40 against Hans Hermans Porsche 908, after Porsches future Panzerwagon, a.k.a. the 917 had all dropped out during the 1969 event. Interestingly, both Justin and Vanina have raced with their fathers – with varying degrees ‘O success. Vanina’s career path (CV) seems far more diverse then Justin’s though... As she’s competed in the Paris Dakar Rally 3-times; (once with her father) FF2000 Stateside; Ferrari Challenge – having won two events; DTM; Belgian GT Series; Porsche Supercup and various Endurance racing series, i.e. ; LMS, LeMans, Spa 24hrs, etc. 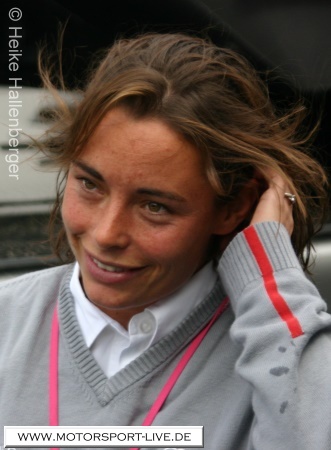 Ironically, Vanina – who reportedly had a not so impressive season in DTM while driving for Audi was replaced by “Thee Leggy ‘Juan,” nee Catherine Legge, who’s subsequently departed Audi and come back Across-the-Pond in hopes of landing an IndyCar ride. Meanwhile, Justin was no slouch of his own, having mentioned how he’d raced with Pops; as I seem to vaguely recall the Bell’s in a Shell sponsored Porsche 962 at le Sarthe... Before Justin went solo and won the 1997 FIA GT2 Championship for Dodge, along with a Le Mans class victory the following year, both aboard those provocative Viper GTSR’s.